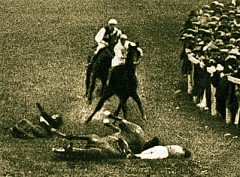 Emily Wilding Davison famously threw herself under the King’s horse at the 1913 Derby, in order to publicise the suffragette cause. She died in hospital a few days later. I truly hope her bravery will be suitably commemorated on its centenary next year. But even at this distance in time, her name lives on, Emily’s List – the New Labour women’s network that helped around a dozen shoulder padded Blairites make it to Westminster – chose the appellation at least in part in Ms Davison’s honour. Back in 1970, a radical young Liberal activist called Peter Hain initiated the Stop the 70 Tour campaign, which threatened to disrupt a series of test matches between England and an all white South African team. The tour was duly cancelled. Hain became a hero to the left, and ended up a New Labour cabinet minister. Yesterday, Unite leader Len McCluskey told the Guardian that the union was considering peaceful civil disobedience at this summer’s Olympics. The defence of the NHS strikes me as being an issue of the same order of importance as votes for women and opposition to apartheid. Yet his words have been condemned across the spectrum, from Baroness Warsi to Ken Livingstone. Even Ed Miliband has tweeted his outrage, branding McCluskey’s call as ‘unacceptable and wrong’. It’s a good job Twitter wasn’t around in 1913 or 1970, I guess. Posted in: Economy, Politics, Public Spending, Sport. The left will commit suicide if it backs up an Olympic target by the Unions. The suffragettes was not an organisation run on democratic lines, but was run as a military organisation with Pankhurst answering to no-one. The focus should be on the suffragettes standing down from terrorist activities of suicide attacks, arson and threatened political assasinations, to working for the National interest in times of need (1914-18).